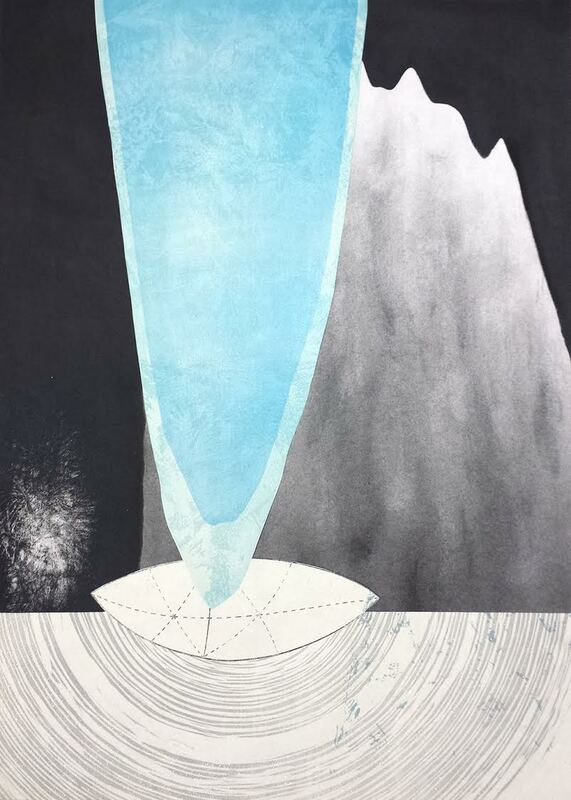 Elemental Iteration is a two-­‐person exhibition featuring works on paper by Lori Spencer and Rebecca Gilbert. The exhibition centers on a collaborative ensemble of prints that employs, as its instigators, the elements earth, water, fire, and air. These elements are explored through a receive-­‐and-­‐respond process between the two artists, with printmaking at its core. Lori Spencer’s work often takes the format of juxtaposed images or image and text. A dialogue is constructed between the elements to inform and build upon each other and to round out a narrative. The narrative is not literal or sequential, but more about sensorial shifts and accumulative references -­‐ as in a walk. She has long been interested in production/reproduction and interpretation/reinterpretation as a method of image making. Her mark-­‐making tools are varied -­‐ from the haptic to the mechanical to the digital to the textual. Characterized by a methodical, technical approach to art making and a down-­‐to-­‐earth recognition of her own primal cravings, Rebecca Gilbert draws on symbolism collected from the natural world to create detailed woodcuts and engravings. For the past several years she has been using dirt, water, sticks, coins, and gold as imagery to symbolize that which we crave, desire, seek out, and hold valuable. Her interest in representing building, digging, and exploring the natural world stems from her interest in people's primal desires to search for treasure, value, and fulfillment. Both artists have extensive exhibition records regionally, nationally, and internationally. They teach in the School of Art at The University of the Arts and live and work in Philadelphia.